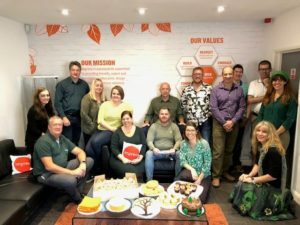 We’re celebrating FSC® Friday at Impress, wearing green and tucking into our homemade FSC themed cakes to raise awareness of the Forest Stewardship Council®. The FSC logo is your assurance that wood, paper and other forest products have been responsibly sourced from well-managed forests and / or recycled materials. FSC Friday is an annual celebration of responsible forestry. It’s held on the last Friday of September, each year. 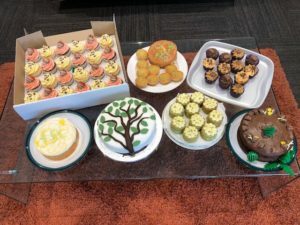 We’ve been busy baking – cup cakes, lemon cakes, chocolate cakes, cakes beautifully decorated with trees, green cakes, you name it, we’ve made it! We’re even dressed in green today! FSC ensure trees that are harvested are replaced or allowed to regenerate naturally whilst part of the forest are protected entirely, in order to protect rate animals and plants. Just let us know if you would like the FSC logo printed on your work. As an FSC certified printer, we are authorised to use the FSC logo, demonstrating there is a chain of custody for your paper right back to the forest of origination. It’s all free, and helps promote responsible forestry, so let’s all showcase our support for the great work of FSC.